I feel kind of bad even calling this a recipe because it was so easy. Here are the ingredients I used (I’ll post everything as serving sizes for a regular recipe, but keep in mind that I quadrupled the recipe here which is why it looks like so much in the picture). *Note: For those wondering, here are the ingredients in Frank’s Red Hot Sauce: Aged Cayenne red peppers, vinegar, water, salt and garlic powder. So, there isn’t anything bad in the ingredients, however there is quite a bit of sodium. I don’t worry too much about my daily sodium intake, but if that is something you are worried about my friend Brittany over at Little B’s Healthy Habits has a really good homemade hot sauce recipe you can find here. 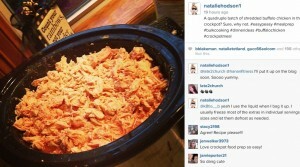 Put the chicken, garlic, and chicken broth in the crockpot. Add water as needed until the chicken is fully immersed in liquid. Cook on high for 3-4 hours until chicken can shred easily with two forks. (Note: when I quadrupled this recipe I had to cook it for 5.5 hours to cook all the way through because the crockpot was so full). Shred chicken and discard of all the broth except for ½ cup. Add hot sauce and cook another 30 minutes or so. Note: I found that this wasn’t quite as spicy as I like it, so I added a little more Frank’s at the end. My husband liked it this way though, so I would say this has a fairly mild heat/spicyness. And that’s it! The chicken will come out super moist and so delicious. I like cooking chicken in bulk and then freezing it into portion size freezer bags so I can pull one or two out, let them defrost, and eat them as needed. It will stay good in the freezer for 2-3 months as long as most of the air is out of your Ziploc. -Assemble all ingredients on each tortilla and bake at 400 for 5-7 minutes, then hi broil for 1-2 minutes (watch carefully at the end so it doesn’t burn). I know I’m not a food photographer, but these were sooo good! If you try this recipe, let me know what you think in the comments below. I would love to hear from you! How do you serve this other than making pizza with the meat? Hey Nicole! It’s really versatile, you could put it on a salad, in lettuce wraps, in a sandwich, etc. I mixed it in with brown rice last night. 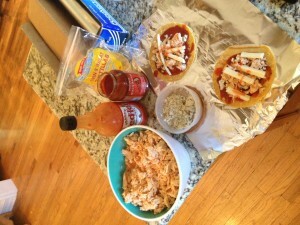 Made this for dinner last night and it was awesome! 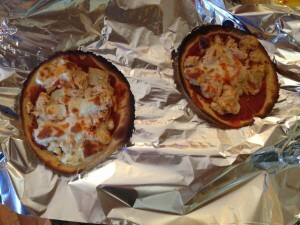 So unbelieveably easy and just a few ingredients which I already had on hand. I had it with some quinoa and today I have leftovers which i’ll be putting in lettuce wraps. What is nutritional info on buffalo chicken? We have the same tastes and nutritional preferences. Love you recipes! Can’t wait to try them all! 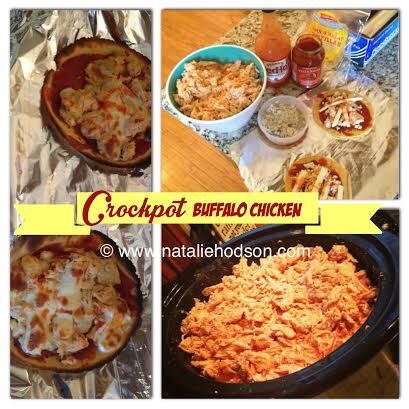 What is s serving size for the crock pot buffalo chicken? I have the strong start and trying to figure out portion sizes. Thank you!